Porter Sculpture Park: 25700 451st Ave., Montrose, S.D., 1/2 mile south of Exit 374 on Interstate 90; portersculpturepark.com. Open daily 8 a.m.-6 p.m. Memorial Day through Labor Day. Adults, $6; ages 13-17, $4; age 12 and younger free. MONTROSE, S.D. — Cartoonlike buzzards wielding a knife and fork, anvil and oversized mallet might seem like an odd way to welcome tourists, but Porter Sculpture Park is no typical roadside attraction. The vultures representing reincarnated politicians are just a few of the more than 40 quirky creations originating in the mind of Wayne Porter, who uses his blacksmith know-how and appreciation of history to turn twisted concepts into metallic works of art. 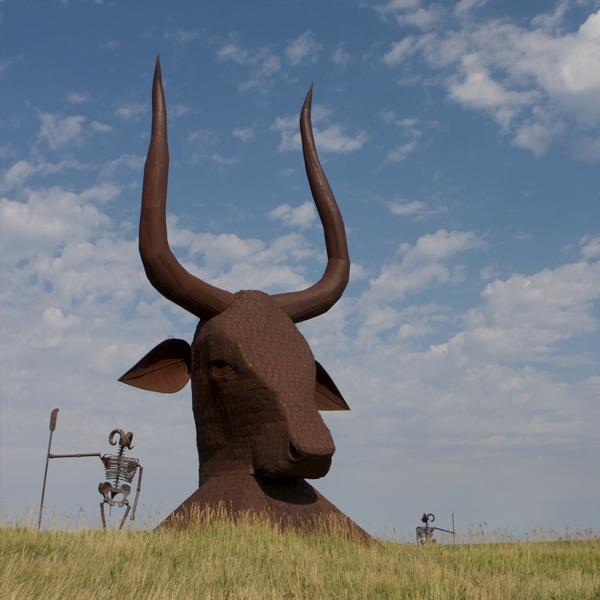 The park’s signature piece is a 60-foot-tall Egyptian-style bull’s head that stares down Interstate 90 motorists as they head out to South Dakota’s Black Hills. Porter spent three years creating the 25-ton monstrosity out of railroad tie plates, dubbing it the “World’s Largest Bull’s Head” on a nearby billboard. “It is amazingly impressive on its scale,” Ludwig said. Porter was born in 1959 in St. Lawrence, S.D., and learned to weld in his father’s blacksmith shop. He created his first piece of art, a bronze metal horse, at the age of 12. After earning degrees in political science and history from South Dakota State University, he returned to the town of less than 200 to become a sheep rancher and help his dad in the shop. Porter passed the nighttime hours by creating sculptures, many of which found display spots around town. An oversized pink metal rocking horse was a favorite of tipsy residents exiting the local bars. “Two o’clock in the morning, people would just have a ball on it,” he said. At some point, buses started arriving with people wanting to pay to view Porter’s creations. The prospect of people handing over cash to see his art intrigued Porter more than sheep, so his brother helped him purchase some rolling prairie hills along an interstate exit in Montrose, S.D. He packed up his creations and opened Porter Sculpture Park in 2000. Winters are spent back home in St. Lawrence crafting in the blacksmith shop, but Porter’s summer home is an onsite camper shared by his trusty Australian shepherd, Bambino. Porter offers guided tours whenever possible, providing insight into his inspirations while straying off on tangents ranging from his love of unsweetened iced tea and chocolate to the dangers of zombie attacks. A mowed path lets visitors meander through the many goldfish, dragons, flowers and birds constructed of such junk metal pieces as old farm equipment, a cement mixer and hot water tanks. A bright blue butterfly flaps its wings atop the pointed finger of a giant yellow hand. Goldfish pour from a two-story-high broken fish bowl as a fly armed with a flyswatter turns the tables on his pests. A spiked club-wielding Jack pops out of Pandora’s box, and skeletal fish holding skeletal umbrellas await a rain that never comes. “I want to pipe in water someday,” Porter said, noting that the sculpture is created with actual pipe. A 20-foot-tall upside-down yellow and pink hammer sits behind a pair of red monks that “people mistakenly think are grim reapers.” He originally wanted nine monks, and he hopes one day to add a musical element. “I love Gregorian chants,” he said. Ludwig said Porter has curated his pieces in a beautiful way, using wide-open prairie spaces as a canvas while sprinkling hidden whimsies throughout. The bronze-colored bull head, which is guarded by four ram-head skeletons, whistles and hums with the passing prairie winds. Porter, during a recent tour, heads inside, pointing and warning of some bats hanging from the rafters. They look real, but they’re actually sub-sculptures he uses on his tour. He laughs, then ascends the staircase and jumps into the porch swing for a few sways before continuing. Porter also claims the “world’s largest ball of invisible twine” but says he’s unsure where he placed the piece. How many people visit each year? Porter has no idea. Porter’s latest project is a 40-foot-tall horse that will top Leonardo Da Vinci’s proposed masterpiece by about 16 feet and weigh more than the bull’s head. (Da Vinci was commissioned to build the largest horse statue in the world in the 15th century, but he never completed the project, though modern versions have been made.) Porter’s horse is back in St. Lawrence and could take years to complete. He has no idea how he’ll transport it to Montrose. The man who has had no formal art training has another ironic bucket-list item. “I want to take an art class sometime,” he said. Thank you for another place to visit! Kelly: I am one of the folk artists from Grassroots Art Center in Lucas. We are going to Branson-Arkansas area Mon. June 25-27th. Would like to see a Grotto or two. Any suggestions? also where is Allen Winklers Home in K.C.? would love to see at least the outside! are there any folk art shows or sites around the K.C.,Mo area coming up this summer? Art Car parades? Love them too! Went to Lawrence’s parade in May. from Marlynne Snare, Garden City, Mo. [email protected] also have an Art Blog: mcreatesdaily.blogspot.com Would be so pleased to hear from you. I don’t know if you happen to have an iPhone, but I created an app called “Best Road Trip Ever” that has just about every folk art site that I have ever heard of on it, as well as a number of other offbeat sites and eateries. Allen Winkler’s home is a private residence, but you can drive by to see it. (1600 Madison Ave) Contact Scott Burnett 816-200-3417 if you want to get in touch with Allan. In 1943, Elise Quigley asked her husband to build her a new house. Because she loved nature, she designed the house with 32 glass window boxes. When he didn’t act quickly enough, Mrs. Q took matters into her own hands. She moved all their belongings out to the barn – forcing him to begin the building process. Along the way, she started adding the decorative rockwork that adds to its splendor. With a Plexiglass butterfly wall inside and bottle trees and stone fences around the grounds, Mrs. Quigley’s digs are undeniably memorable. Shebly Ravelette is another interesting stop…and it is a very small B&B. You can also spend the night at the castle. ”I spent my whole life trying to get away from this place,” Mr. Dwyer said the other day as he showed off the home and garden he has developed on a 10-acre compound overlooking State Route 13, in the heart of town. ”But I found it’s the best place in the world to come home to,” he added. He has had workers toiling for years developing the terraces facing a 50-foot cliff that now make up the rock garden where his wandering eagle is perched. And the eagle has been joined by a mate of solid bronze with a wingspread of 12 feet.